Snow in Summer is a fast growing groundcover. The leaves are a silver color and it is topped with masses of white flowers from late spring to early summer. It will grow to a height of 6" to 8" tall and 24" to 32" in width. Plant Snow in Summer in a dry, well drained area in full sun for best results. 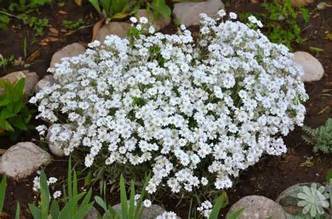 Snow in Summer is a great plant to use for spilling over rock walls or on steep sunny slopes. This perennial is often used as a lawn substitute. It is drought tolerant once it is established and can easily be grown in containers. Divide in spring or fall. Trim the plants back after blooming and every couple of weeks to maintain a compact, tidy appearance. Use Snow in Summer in a Rock Garden and it is a great choice for a Moon Garden with the white flowers and silver foliage.